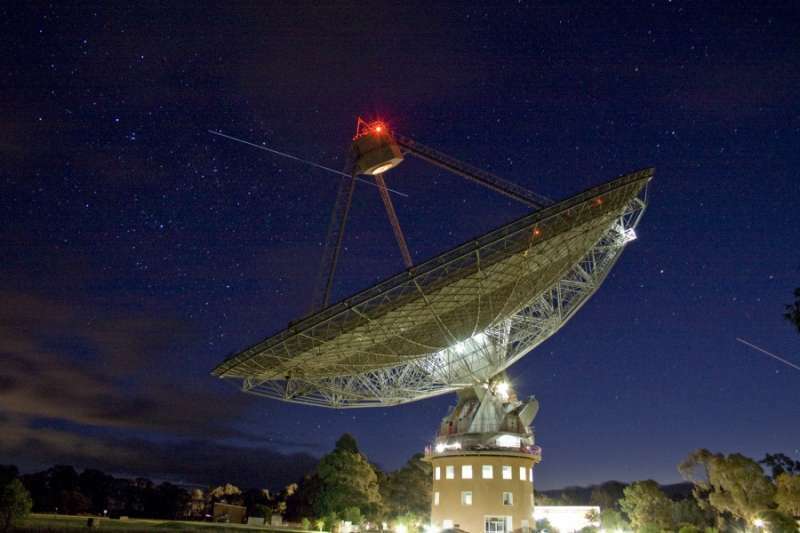 Explanation: The Parkes 64 meter radio telescope is known for its contribution to human spaceflight, famously supplying television images from the Moon to denizens of planet Earth during Apollo 11. The enormous, steerable, single dish looms in the foreground of this early evening skyscape. Above it, the starry skies of New South Wales, Australia include familiar southerly constellations Vela, Puppis, and Hydra along with a sight that will never be seen again. Still glinting in sunlight and streaking right to left just below the radio telescope's focus cabin, the space shuttle orbiter Atlantis has just undocked with the International Space Station for the final time. The space station itself follows arcing from the lower right corner of the frame, about two minutes behind Atlantis in low Earth orbit. Atlantis is set for its final landing early this morning (July 21, 5:56am EDT) at NASA's Kennedy Space Center.